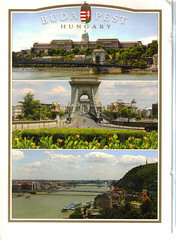 A Postcrossing post card from Christina in Hungary. Christina is studying law, and organizes weddings. The top picture shows Buda Castle, the historical castle of Hungarian Kings, completed in 1265. The second picture is the Széchenyi Chain Bridge – A suspension bridge which was the first permanent bridge across the Danube connecting the cities of Buda and Pest in 1849. The third picture is of the River Danube with the Szabadság Szobor or Liberty Statue standing on Gellért Hill. Including its base, the statue stands 40 metres high and comemorates the liberation of Hungary from Nazi occupation by Soviet troops during World War II. Thanks for the fascinating postcard, Christina!